Restrictions: The area is closed to the use of aircraft for hunting moose, including the transportation of moose hunters, their hunting gear, or parts of moose; however, this provision does not apply to the transportation of moose hunters, their hunting gear, or parts of moose by aircraft between publicly owned airports, or the transportation into the area of game meat that has been processed for human consumption. 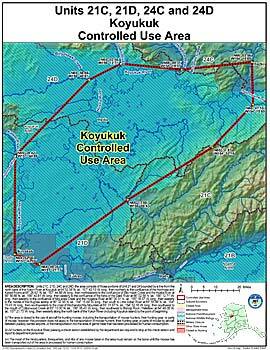 All hunters on the Koyukuk River passing the department's check station at Ella's Cabin (15 miles upstream from the Yukon on the Koyukuk River) are required to stop at the check station and report to department personnel. The meat of the hindquarters, forequarters, and ribs of any moose taken in the area must remain on the bone until the moose has been transported out of the area.